I am a lifelong fisherman with over 40 years experience of fishing all over the UK, Europe, USA and New Zealand. Based in Glasgow I fish wherever and whenever I can for trout, salmon, sea trout, grayling, mullet and pike in Scottish waters. I hold a Scottish Game Angling Instructor Certificate (SGAIC) for single handed fly fishing, a Game Angling Instructors Certificate for double handed casting. I am also qualified for the Advanced Professional Game Angling Instructors Certificate (APGAI) for single handed fly casting and fly tying. Finally I am a UKCC Level 2 coach and a licensed SANA coach. These qualifications confirm that I have been examined to a very high standard in all aspects of game angling as an instructor and registered coach. I have fished for Scotland on several occasions as a river internationalist and now specialise in guiding on the Trossach Lochs and Rivers Clyde, Tay and Tweed systems. I am the founding member of the Glasgow Casting Club which meets weekly and is open to all. 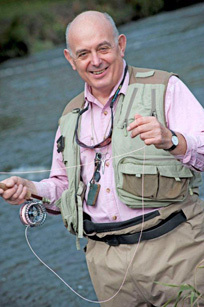 I offer qualified fly fishing and fly casting instruction in Glasgow, and across Scotland. As an APGAI, SGAIC and GAIC certified instructor I provide top quality tuition and coaching for beginners, intermediate and advanced fly fishers.